Some things can be said best without words. Music of any genre should not and will not be confined or hindered by any set of rules or regulations. This is what allowed the late J Dilla’s final masterwork, known at Donuts, to transcend the idea of continuity. An album that consists of 31 extremely diverse yet mutual tracks spanning just over 42 minutes. Starting with and outro and ending with an intro, the album is a seemingly endless, looping experience with such intriguing construction that it is hard to think these Donuts will ever go stale. Dilla’s uncanny ability to cut up and chop any record into a buffet of delicious samples and throw them together over knocking, eclectic drums is in full-effect throughout this album. The pacing of the album is perfect throughout. Only the second track on the album manages to break the two-minute mark for length and it consists of low guitar riffs that separate soulful, funky chants of “Workin on it”. The album’s foundation is very obscure sampling cuts from recognizable works that swing from song to song so abruptly that you’re not even given a chance to get bored. With cuts clocking in at under 40 seconds, the transitions feel confident the way they connect songs with such varying tempos and moods. From slow, sombering tones to sharp quick snares and horns, you never get too comfortable in the chaos; but the chaos is all sorts of beautiful. If a four or more minute instrumental is enough to make your mind venture into the realm of boredom and dullness, then this album represents one of the most immaculately crafted swords ever made. It is consistently inconsistent in the best way possible. Dilla never gets hung up on a specific style or sound and the final result is 31 tracks that represent the sounds of decades past, present and future. The album’s hand-crafted stitching together of pieces is made evident by the sporadic scratches and the microscopic sample splicing. Often times, single words are shortened or elongated to match the spacing and instrumentation of Dilla’s cuts and drums. His entire musical concept of loading songs with samples and production lacking in electronic synth sounds but loaded with organic, reworked material is entrancing. Drawing from a number of different genres Dilla remains impossible to pigeonhole. His one-of-a-kind talent isn’t the simple surface fact that he can make beats that sound good; it lies within his process of taking unrelated content and cutting it with razor blade precision then fashioning it back together to create something completely new and creative that can be heard in many more ways than one. Donuts is so unpredictable and obscure that it saves itself from the curse of popular music that consists of beats so recycled you get sick of it after only a few listens. Each time you listen through this album or any one of its tracks, you will likely hear a sample, scratch or kick that you missed every listen prior. You are left with the ability to experience that sense of discovery that I can only imagine Dilla felt as he dusted off record after record looking for that moment of sonic gold to cut and manipulate. 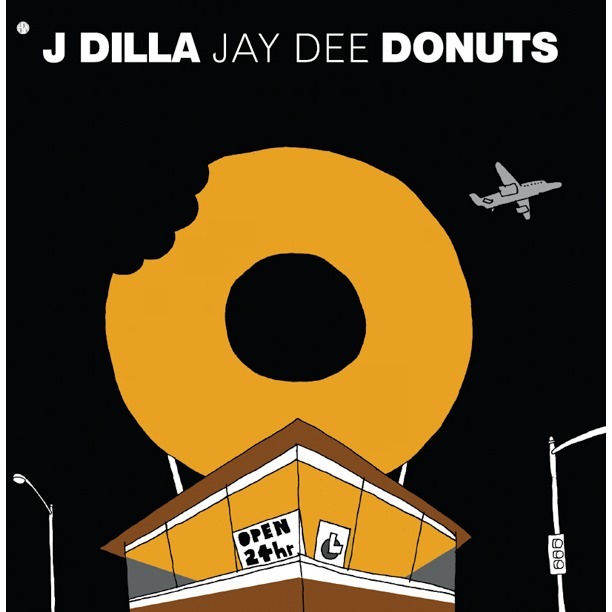 It’s sad to think that Dilla passed away only three days after releasing this monumental collection of material, but it is obvious that his legacy will only continue to develop through the passing along of these sweet, sweet Donuts from artist to artist, just as Dilla would’ve wanted.